Padiham face a stern test tomorrow as they host unbeaten City of Liverpool at the Ruby Civil Arena. But first team coach Alex Norwood sees no reason why the Storks can’t become the first team to beat the Purps, at the 16th attempt. 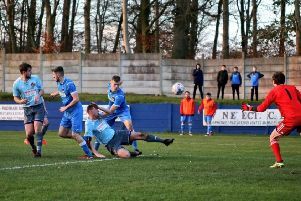 Padiham go into the game on the back of Tuesday night’s narrow 1-0 defeat at in-form Irlam, but Norwood saw enough to give him hope they can spring a surprise tomorrow. City of Liverpool are eight points clear at the top, but Norwood said: “City of Liverpool are the best side in the division, better than Runcorn Town, in my opinion, and they have spent a lot of money – they have a very good squad. “But they did last season, and we gave them two very good games. “We beat them at home and conceded a penalty with the last kick there, which cost us a point. “It will be really tough, but we know what we need to do. “We’ll set up to get a result, and they won’t go unbeaten all season, especially with the games coming thick and fast, so why can’t we be the ones to beat them? Padiham could be without Ben Hoskin, whose girlfriend is due to give birth, but the Storks should, otherwise, have everyone available. And Norwood sees promising signs from the players, despite the defeat at Irlam, as they went down to Liam Pollitt’s goal nine minutes before half-time. He said: “We largely nullified Irlam’s threat, Tony (Aghayere) only had one save to make really. “But in the last couple of games, we’ve not taken our chances. “The recent defeat against Bootle was horrendous, that was a real turning point. “We’ve put a lot of work in since then, looking at our shape without the ball, and that’s given us a platform. “We were conceding three, four, five. but the work we’ve put in has made sure we’ve been able to stay in games. “And our front four are a handful for anyone, and we’ve added Alex Ralph from Charnock Richard as well. “It’s probablt gone the other way in that we’re creating chances and not taking enough, but the players are showing good signs. Looking back at Tuesday, Padiham were a touch unfortunate: “The lads played really well, Irlam are one of the form teams in the division, and they have some rteal pace and physicality. “Their right winger Marcus Perry is one of the best wide players in the league, but the lads were brilliant. “We didn’t keep the ball well enough for the first half hour, but they didn’t create much. * Burnley United thumped third place Feniscowles and Pleasington 7-3 at the Memorial Ground to move within five points of Storefirst East Lancashire League First Division leaders Mill Hill with a game in hand. Paul Fildes’ side cruised to victory against the Blackburn side as Wayne Morrison and Billy Poole both netted twice, with Sameed Ellahi, Hashim Abdullah and Joe Rodriguez also on target. The sides meet again, also in league action, witjh the reverse fixture at Barden, with kick-off at 2 p.m. In the Second Division, Burnley United’s reserves were also among the goals at Barden. They took on Waddington Reserves and emerged 6-2 winners. Cole Hayman and Will Burrows scored two apiece, with further goals from Kuda Chingwaro and Jon Ashworth. United’s second string are at the Heys Sports Complex tomorrow to face Oswaldtwistle St Mary’s Reserves, again with kick-off at 2 p.m. In the Lancashire Amateur League, it was a disappointing afternoon for Burnley Belvedere. Phil Ashton’s Greens went down 2-0 at Marl Pits Sports Centre to Rossendale. That, combined with Whitworth Valley’s 2-1 win at home to Thornleigh , leaves Belvedere four points behind the leaders with a game in hand, and two points clear of Failsworth Dynamos in third, after their 4-4 draw at home to Rochdale St Clements. Burnley Belvedere are at home to Blackrod Town Firsts tomorrow, with kick-off at 2 p.m. There was better news for Belvedere’s reserves, who beat Prairie United 3-0 at Holden Road on Saturday as they claimed their first win in the East Lancashire League First Division after 10-successive defeats. The reserves are at bottom side Whinney Hill’s Burnley Road ground tomorrow, kick-off 2 p.m.
Whinney Hill have lost all 12 of their league games to date so far this season, and sit three points behind Belvedere, who have played a game less.